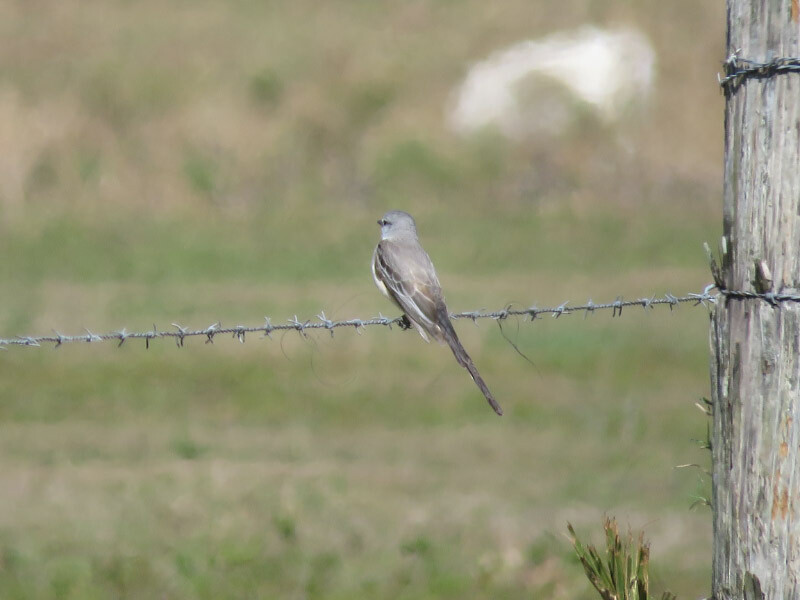 Continuing the third day of the Space Coast Birding and Wildlife Festival….this is the last post about our field trip into Central Florida. The high point of the day was seeing a Whooping Crane. This is one that started out life at the Patuxent National Wildlife Refuge (program now ended) and doesn’t migrate. It generally stays on a cattle ranch and enjoys cattle feed! We stopped at the ranch’s entrance, so the pictures are a little blurry with the max zoom required to take the picture. There were some sandhill cranes around as well and it was obvious this bird was different – bigger and very white. Our guides told us that the dwindling numbers of whooping cranes in Florida will be captured and relocated to join a non-migrating group in Louisiana. Even though it was chilly while we were in Florida, it was still much warmer than in Maryland. 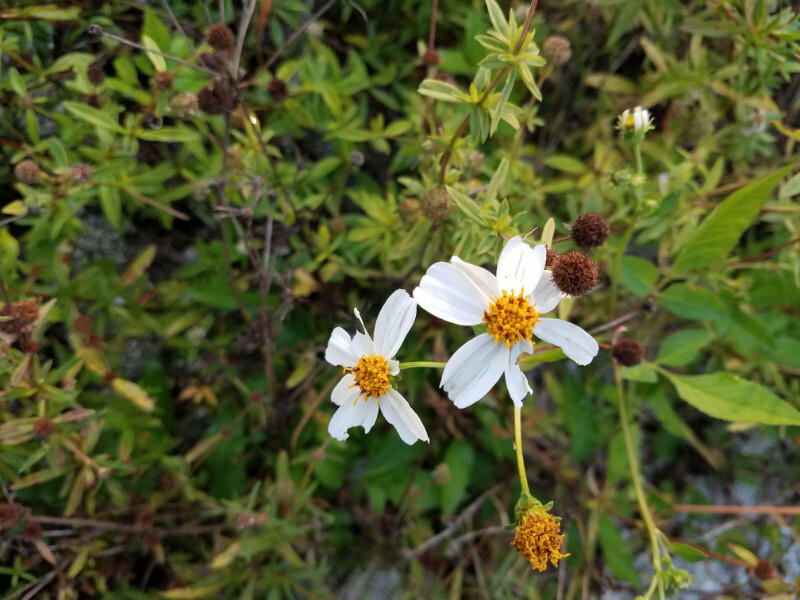 There were flowers blooming and going to seed. The deciduous trees had lost their leaves. 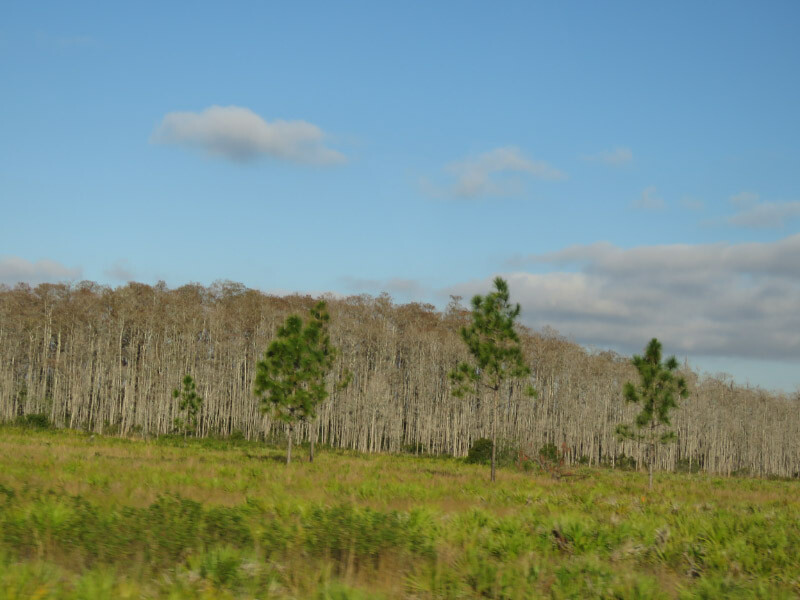 The guides pointed out bald cypress domes…the tallest and oldest trees being in the center. 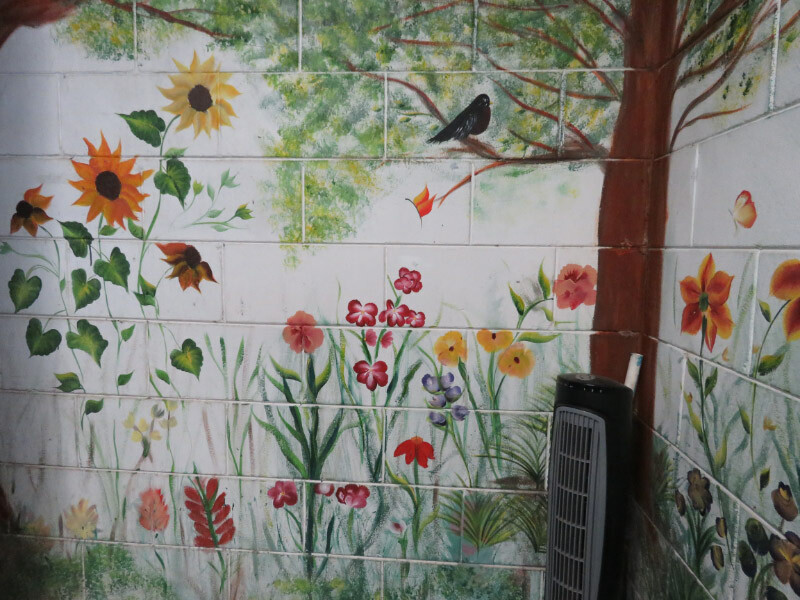 I was pleasantly surprised by the paint job in the rest room of the place we stopped for our picnic lunch. Very artfully done! 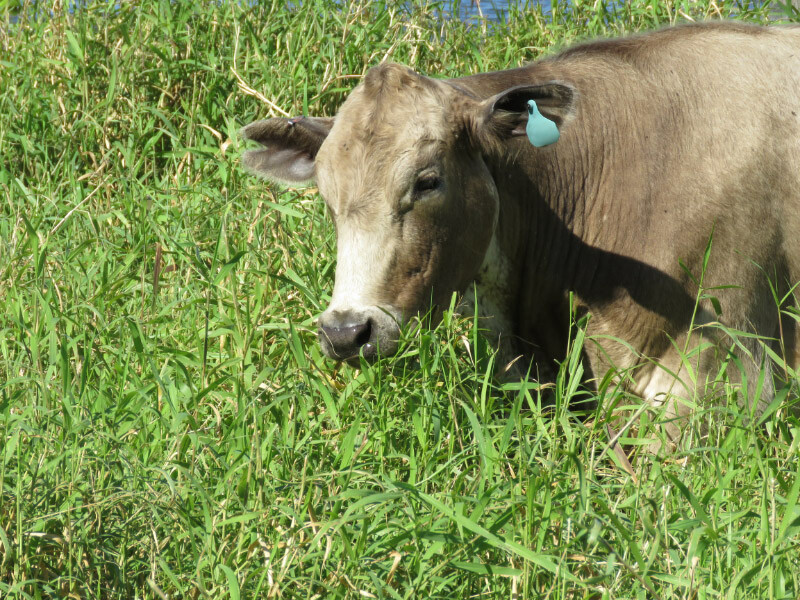 A cow escaped the pasture and was in tall grass heaven near one lake. Fortunately, the grass held the cow’s attention and it didn’t wonder up into the picnic area. 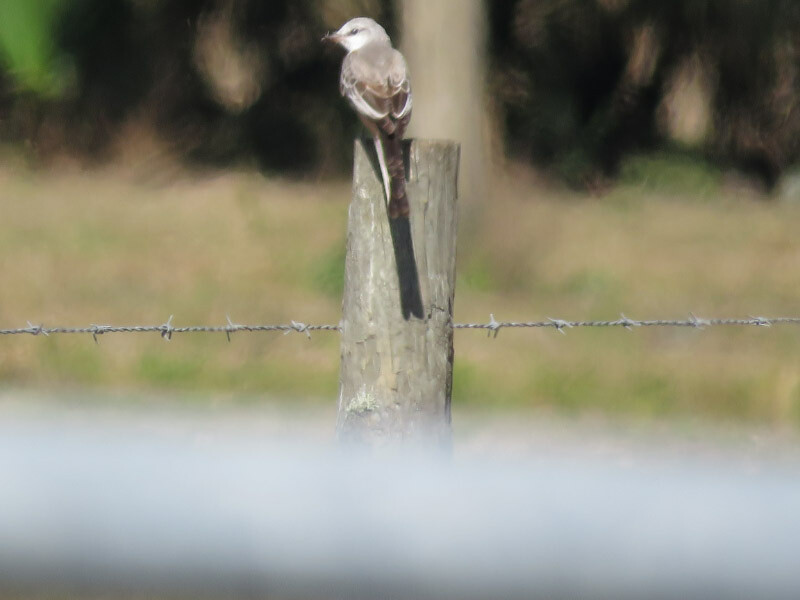 We stopped when we spotted a Scissor-tailed Flycatcher on a fence post. It moved to the fence wire and I got another angle. We were just getting ready to retreat to the bus when a Crested Caracara flew in with some prey followed by an entourage of Turkey Vultures. 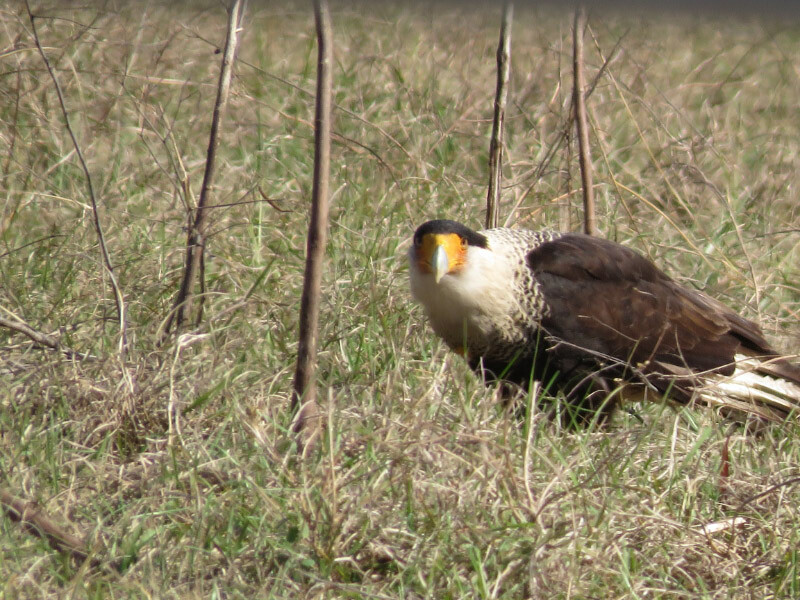 The big lenses and binoculars were trained on the caracara trying to figure out what the prey was. Maybe a snake. They stayed around long enough for me to take a portraits. The crest of the caracara reminds me of a bad toupee. The vultures kept a respectful distance but would move in as soon as the caracara left. We made a last stop before the end of the day at the Helen and Allan Cruikshank Sanctuary where we had spent a very rainy morning a few days before. This time we saw an Osprey before the scrub jays. 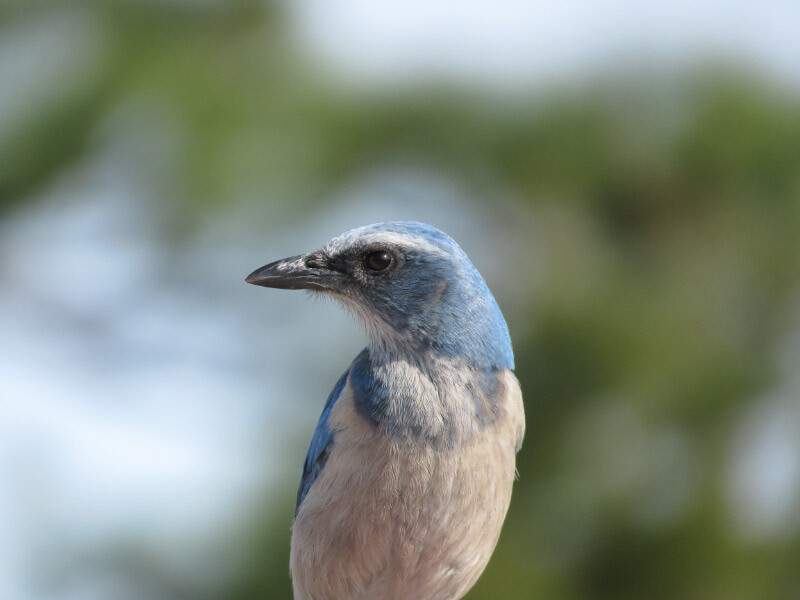 But the Florida Scrub Jays showed up soon enough. One alighted on the hand of one of our guides – probably thinking there would be a peanut for it…no peanut appeared. Another bird stomped on the hat of our other guide. The bird obligingly turned around for him to get a selfie. That was the last event of the day. Note that all the jays we saw were banded…sometimes multiple times. Our day in the field (5AM to 4PM) was probably the best of the festival…so much seen in a relatively short period of time!